The Westlands Water District’s Board of Directors rejected Governor Jerry Brown’s Delta Tunnels project on September 19 because the California WaterFix “is not financially viable,” according to a statement from the district. “After a thorough analysis by independent consultants and District staff, multiple special board meetings, and grower workshops, the Westlands Water District Board of Directors voted by a margin of 7 to 1 to not participate in the California WaterFix (CWF). The District appreciates the efforts of Governor Jerry Brown and his administration to balance the interests of many. Indeed, over the last twelve months the State administration worked diligently to define a viable project, but from Westlands' perspective, the project is not financially viable. Westlands' principal source of water is the Central Valley Project, a project operated by the United States Bureau of Reclamation. The CVP is integrated both operationally and financially. However, under the “participation approach” announced by Reclamation for CWF, only CVP contractors that chose to participate in CWF would pay the costs of constructing and operating new facilities, with no assurance that those contractors would receive the water supply benefits resulting from CWF. Westlands supported the development of CWF and has invested considerable financial resources, time, and expertise into its planning, but consistently stated that it would not obligate the farmers it serves to billions of dollars in debt without reasonable assurances that the project would produce reliable, affordable water supplies. The District recognizes that solving Delta conveyance issues is critical to ensuring reliable water supplies to support the economy of the State, but it cannot support a project that would make water supplies for its farmers unaffordable. 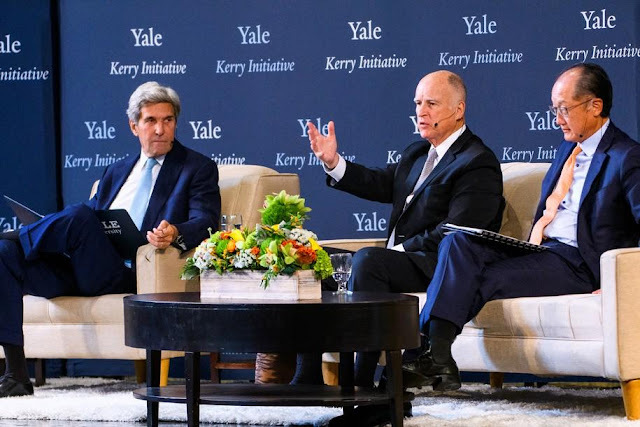 Governor Jerry Brown, who has been out of the state at climate conferences in New York and Connecticut this week, hasn’t yet responded to the Westlands decision. However, California Natural Resources Secretary John Laird tried to downplay the significance of the vote against the tunnels. Carolee Krieger, Executive Director of the California Water Impact Network, was also pleased with the Westlands vote. The Santa Clara Valley Water District Board is tentatively scheduled to vote on whether or not to support the WaterFix on October 17. Yesterday the district voted to pass a "no regrets package" planning $100 million for 9 different projects like stormwater capture, leak repair and gray water, according to Barbara Barrigan-Parrilla, Executive Director of Restore the Delta (RTD). Also yesterday, the Los Angeles City Council Energy and Environmental Committee voted no for the Delta Tunnels project -- until the project is fully financed and the Metropolitan Water District (MWD) of Southern California meets all their considerations. Delta Tunnels opponents, including water ratepayers, environmental justice advocates, family farmers, Tribal leaders, Delta residents, recreational and commercial fishermen, conservationists, and many elected officials, say the project is potentially the most environmentally destructive public works project in California history. The tunnels will hasten the extinction of Central Valley steelhead, Sacramento River winter-run Chinook salmon, Delta and longfin smelt, green sturgeon and other fish species, as well as imperil salmon and steelhead populations on both the Trinity and Klamath rivers, according to project opponents and scientists.